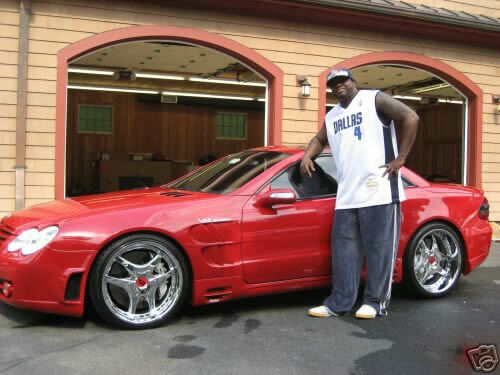 Here you see David Ortiz posing infront of his red SL65 amg equipped with all chrome Lowenharts and a Lorinser body kit. Love the color, love the car, love the wheels. This is one of my favorite all time wheels, I love the split 3 spoke style. It looks like it has about a 5″ lip in the rear which is awesome for a mercedes with big brakes. I dont know what association he has with dallas and why hes wearing the mavericks jersey but I am feeling this boston red SL. Go Sox!